My friend from college, Christine was coming to visit me this weekend and we were thinking of things we could do. Since we both love to cook, I thought it would be fun to make Pinterest inspired recipes. I always go on Pinterest for ideas but I never really get a chance to make them. She sent me a few links that she liked and I picked out a few. Off to Market Basket I went and returned home with a cart full of groceries for our fun filled day of cooking. The first recipe we started with was the "Philly Cheesesteak stuffed bell peppers" courtesy of "Quick & Easy Recipes". This was a great Atkins friendly recipe with minimal carbs. We didn't follow the recipe to the exact and left out the butter and the first layer of provolone cheese. We threw in a couple of sweet red bell peppers for contrast against the green peppers. The recipe came out delicious and we will definitely make this again! NOTE: We started drinking and multi tasking in the kitchen so there aren't many step by step pictures for the next few recipes. We started on the buffalo chicken bites courtesy of Laloosh. Again, we didn't follow it exactly as we used regular flour instead of whole wheat and regular cream cheese in stead of fat free. Even using their exact recipes, I am skeptical of the Weight Watchers points the website claims, (5 pieces for 3 WW points). I find that too good to be true. These little bites of heaven were to die for! They are a nice twist of a similar recipe that I already make, Kelly's buffalo dip recipe. We will definitely be making these again! I think I would just use a little less buffalo sauce since it was a bit on the salty side. Lastly, we had a dessert recipe that was a disaster turned into something wonderful by accident. We intended on making an Oreo & Ice Cream sandwich cake recipe by Kraft. Being the "know it all" that I am, I didn't fully read the instructions upfront and I messed up making INSTANT PUDDING! Who does that? First the milk was supposed to be COLD and I boiled it so the pudding was clumpy only to REALIZE that the pudding mix was supposed to be mixed with the jot fudge and not prepared per the instructions on the box. Nevertheless, the sandwiches started melting and would stay true to the "square form" so my nephew and I threw in all the ingredients into a trifle dish to make an Fudge Oreo & Ice Cream sandwich trifle. In addition to the Pinterest food, we also made buffalo chicken wings, phad thai, dumplings and Kelly's buffalo chicken dip. I picked up a bottle of Moodlight Meadery Kurt's apple pie, alcohol made from fermented honey. I tried it at a previous wine tasting and really liked it. The alcohol content is a bit steeper than wine and beer and it tastes just like apple pie. We had a big sleepover and made breakfast the next morning with waffles, English muffins, Kringle (courtesy of the Omnilite), western scrambled egg casserole, bacon, sausages, pepperoni and provolone croissant role ups and fresh cut strawberries. Dessert was cake for my brother's 31st birthday. 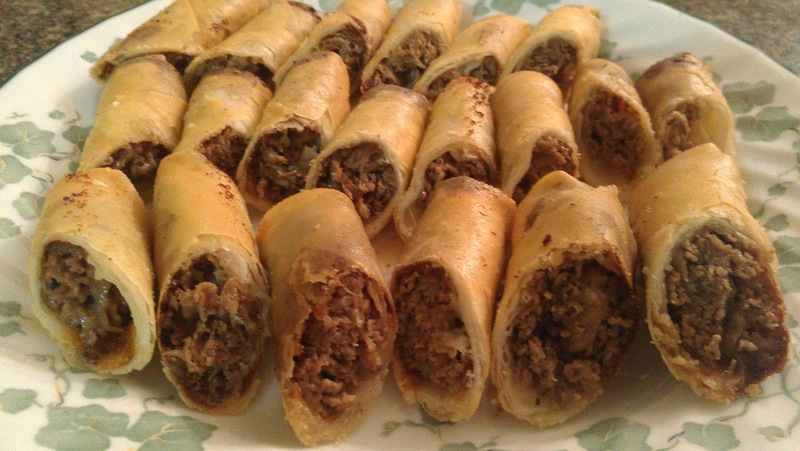 Now taking orders Steak and Cheese Egg Rolls for Super Bowl Sunday! Number of platters that will be made are limited, so get your orders in early! Serve with your favorite cheese dipping sauce. This isn't a "TRUE" Mai Tai recipe but it did the trick, got my buzzed and didn't leave me hungover, plus I got some FB messages asking for the recipe once I posted the photo on FB so I thought I would share. There are a bunch of recipes online but the thought of buying different brands of rum, light, dark, almond flavored liqueur sounded a bit expensive. I picked up a bottle of premixed Bacardi Mai Tai at a local liquor store. The color and texture was not what I was accustomed to at the Chinese restaurants so I decided to "doctor" it up a bit. The consistency was too light so I added a splash of orange juice and grapefruit juice. At only a mere 10% alcohol, the premade drink itself was not going to get me drunk so I added 2 shots of Gosling's black seal Bermuda black rum. 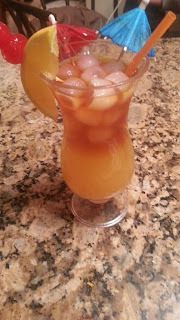 I topped it off with a tiny bit of grenadine and garnished with fresh oranges and maraschino cherries and an umbrella. Anyhow, "Yow Hon" is a family staple for special occasions and gatherings for Cambodian families. The broth is not intended for one with a limited palate. It boasts many flavors that are acquired by the regulars ranging from pungent shrimp paste, Taiwanese BBQ sauce, soybean paste and a variety of chili. Although the delicacy is a long tradition among Cambodians, other Asian nationalities have their own "hot pot" traditions with different bases for the sauces and brother. For instance, the Japanese eateries in Boston are popular hot spots for "Shabu-Shabu" or "Sukiyaki" where patrons cook their ingredients table-side. Those restaurants offer a variety of broths ranging from simple miso base to a Thai inspired "Yom Yum" soup broth. I also met a Burmese woman who told me that the hot pot tradition was also a favorite among her people. She advised that although the cooking tradition was similar, their broth tasted different and coconut milk wasn't used. It doesn't take different nationalities to compare brother, each Cambodian family makes the sauce different and chooses different meats, seafood and vegetables per their own traditions or preferences. Some families prefer it spicy and some likes it sweet, we prefer it sweet and sour. Add all ingredients in a large sauce pan and let it simmer. Taste the broth to see if if requires sugar, salt or MSG. I know this is difficult to do as a "rookie" but if its bland, add a pinch of salt or MSG, if its too salty, add some water, beer or coconut soda. You will become a pro in no time. Set the sauce on the back burner and set aside. Tip: I prefer to precook my meatballs and quail eggs and let it cook in the broth and simmer before serving. The most common issue with preparing this sauce is making it too thin. If the sauce is too thin, the vegetables and meat will not have any flavor after you remove it from the broth. The sauce will fall right back into the pot. To prevent this, I've seen people go as far as to cook and puree meat and add it to the broth for flavor and texture. If you don't want to do that, you can use a little more coconut milk and add peanuts. Again, each family has their own taste and preferences. I was recently introduced to new mushrooms and root vegetables that I would have never thought on my own. The most common green vegetable is watercress, which is known to be a great digestive aid and maybe helpful in assisting with the digestion of this heavy meal that includes large amounts of hard to digest protein. There is such a great range for protein options that its hard to list them all. Some of the familiar choices included shrimp, beef and quail eggs. I've seen people use raw chicken (not recommended) and ox tail, which requires parboiling. Many families love cow stomach but the Mo and I beg to differ. The traditional way of eating this dish is served with white Jasmine rice. Along the years, "Banh Hoi" or rice vermicelli has become increasingly popular and the main choice. Some people like them both and eat both at one sitting. Some families even opt for other rice noodle options as "Chow food", Chinese yellow noodles or Japanese udon noodles. I'll like mine with rice vermicelli. Up until last week, I use to eat the dish with a pre-made bottled soy bean sauce. My friend Nat, made us a similar Korean version using soy bean paste, chili paste and a bit of sesame oil. I will never go back to my old bottled sauce again. Hot pot: There are a great number of hotpots on the market ranging from cheap to expensive. The traditional hot pot uses charcoal and newer ones uses propane and others are electrical. We use our electric square skillet. Soup Ladle: This comes in handy when someone's noodles are lacking broth and they want to put an extra scoop of broth for additional flavor. Tongs: This comes in handy when someone doesn't want to get their hands messy touching raw meat and wants to put a large amount of meats or there are large amounts of cooked food to be removed. Once the sauce is poured in the hot pot and it boils, it is ready to be served. Pass along plates of rice or vermicelli as one or two people can help add in the protein and vegetables. The aroma of the sauce will surely make the excite the crowd and make them salivate. Throw in the meats and vegetables in and remove them as they cook. Allow additional cooking time for raw meats but vegetables are fine after a quick blanching. It's common courtesy to add in additional raw ingredients after you remove cooked ones for your own plate. Unless you are at Tasty Dumpling in New York's Chinatown, you probably can't find 5 pork dumplings for $1.25 or less at a local joint but you can prepare your own for almost the same price. Although I've never really made any dumplings from scratch, they are easy to prepare and serve. I prepared 15 dumplings for less than $3.00 including the sauce. 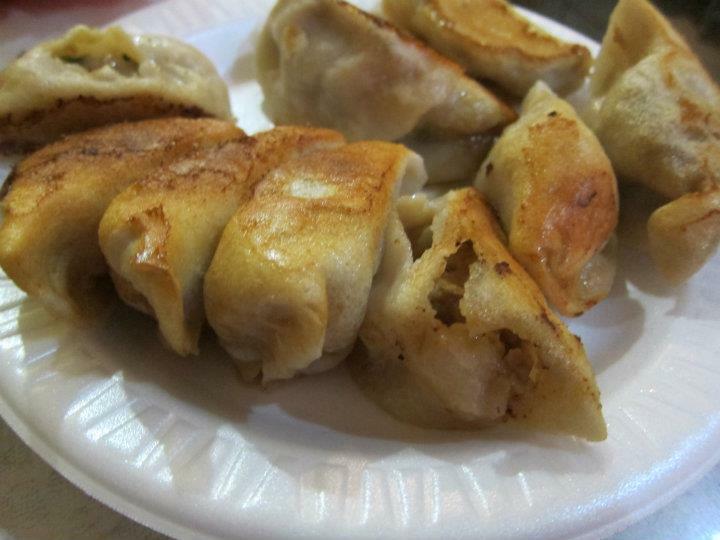 The delicious delight has different variations and names that isn't limited to wontons, "pot stickers" Peking raviolis, and "Giozas" (Japanese). The outside layer can also vary from a thin starchy paper to a thick dough-like consistency. The most common dipping sauce that I've seen served with this popular dish, is a ginger-soy dipping sauce usually garnished with sesame seeds or scallions. While shopping at HMART today, I picked up 3 bags of frozen pork dumplings for $10.00. There were a few different varieties but I opted for, pork and chive, pork and shrimp and plain pork dumplings. ($3.33 each) If HMART is out of the way, they sell different brand of dumpling varieties at Costco's, Market Basket, Hannaford and local Asian supermarkets that can be prepared the same way. Since we had a big breakfast and planned on skipping lunch, I thought I would make us a snack before our late dinner. That's the best part of these Asian delights, they store easily in the freezer and can be prepped up in 10 minutes or less for snacks for two or appetizers for a large gathering. They can be served as finger foods or served as entrees boiled in chicken broth with noodles. Once the pan heats up, add the vegetable oil and turn the temperature to medium heat. Give is 30 secs to heat up. Add the strained dumplings. Be very careful of the oil splattering. This is caused by any excess water left on the dumplings. Let the dumplings pan fry for a few minutes on each side until golden brown. Serve with the ginger soy dipping sauce and optional sriracha hot sauce. PS. I usually make my own ginger soy sauce from soy sauce, fresh ginger and sesame oil but I already had a premade bottle from my last trip to Trader Joe's. If you don't feel like making your own sauce, I recommend theirs as its thick and not too salty as other brands on the market. All the "Asian" influenced products are labeled under "Trader Ming's", thought that was cute.